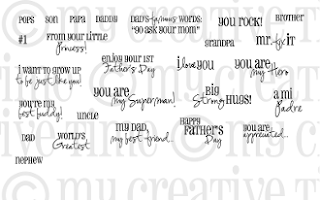 Liz's Paper Loft: My Creative Time's My Favorite Stamp of the Month! My Creative Time's My Favorite Stamp of the Month! Hello Paper Lovers and all things creative! Today is My Favorite Stamp of the Month at My Creative Time! However, Emma decided that we should feature three sets this month! "Your My Best Buddy", "My Little Firecracker" & "Fun in the Sun"! If you saw my post yesterday then you already know that I LOVE RED, WHITE, and BLUE, it's no surprise that I would use "My Little Firecraker" for my project today! Also yesterday I used Teresa Collins Sports Edition for my tag, so when I was ready to make this favor bag, I just grabbed a few scraps that was already out! EASY PEASY!!! I stamped the star border in red then cut out the 2 larger stars. I keep forgeting that when you add the glossy accents to SU ink, it changes the color! So I added some chunky glitter to make the stars sparkle! These would be perfect for a 4th of July party! Wouldn't they be SO CUTE with sparklers in them too? 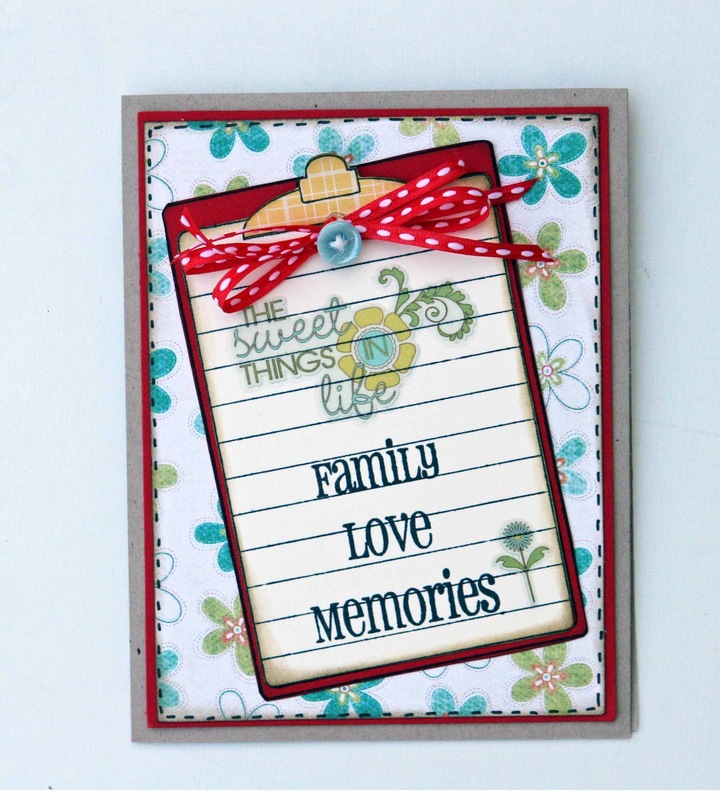 This is a card I made last year with Fun in the Sun Stamp Set, you can click HERE for the recipe! All three of these Stamp Sets will be on sale Sale and will end on June 30th! So hurry and pick up all three! One last thing we will have a "Link Up Party" with anyone who owns these sets already can make a project OR show an older project using these sets! Link them up to Mr. Linky at My Creative Time, you'll have two weeks to do so!!! Can't wait to see what you link up!! Love your Red Vines treat bag, Liz! ADORABLE!!! Your treat bag is so cute Liz! Liz ~ LOVE the treat bag! So CUTE! Way to go using the scraps too! 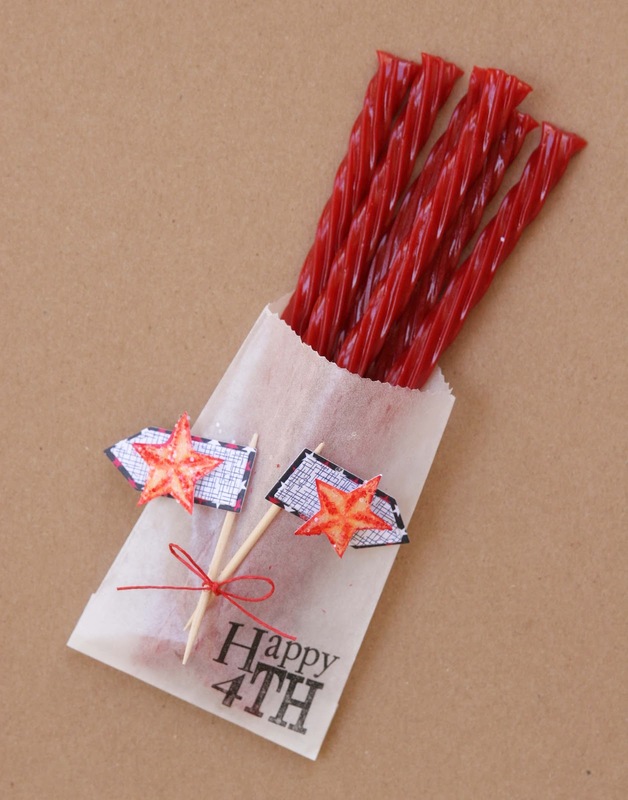 I think sparklers would be PERFECT in them too! GREAT idea! Oh that card is just BEAUTIFUL too! Awesome as always! What a yummy treat bag! 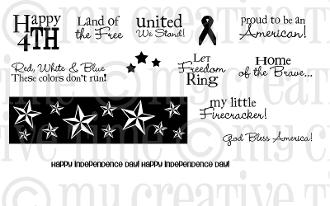 Love the stars and the little flags! Looks great Liz! 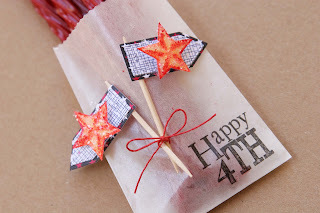 I love how you made little flags with toothpicks and banner tags...your sparkly stars were a great idea. How do you think of these super cute ideas??? Keep taking those creative pills...they are working..LOVE the licorice coming out! Hi Liz- Love this simple design! You've also inspired me to make my own monogrammed flower & burlap picture frame. I'd love if you'd stopped by and check out my post today....www.ribbonsandglue.com.